At this point, Ken Levine is more than a game designer. Ever since the BioShock franchise took off he’s become something of a figurehead for these games and of developer Irrational Games as a whole. Thus, it just makes sense that he’d personally detail the upcoming special edition releases of BioShock Infinite. That’s neat, but in addition to all of these extras those of you willing to shell out $150 for the Ultimate Songbird Edition will also receive the statue you see at right. 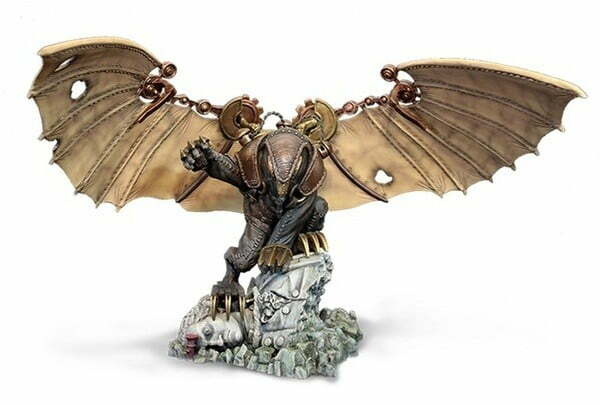 According to Levine that’s a 9.5-inch-tall replica of BioShock Infinite’s Songbird, the monstrous creature seen in the image at top and the obvious inspiration for the “Songbird Edition” name. While we like all of the additions Irrational and Levine have planned for these collector’s edition bundles (and we do like that statue quite a bit) we’re finding it a bit difficult to justify an additional $70 purely for a still-life reconstruction of a fictional character that has absolutely no utility or purpose beyond looking cool on a shelf. Then again, BioShock has an incredibly dedicated fanbase, so we doubt that the Ultimate Songbird Edition will have much trouble selling out immediately.